But… resting doesn’t mean I haven’t been active. Quite the opposite! 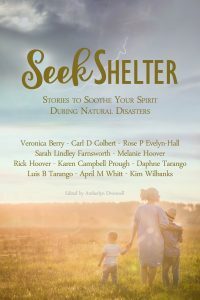 It means I stepped back and focused on self-care, part of which included writing my latest book, Seek Shelter: Stories to Soothe Your Spirit During Natural Disasters. This book has an interesting backstory to it. And to tell you all about it is my dear friend and co-author, Kim Wilbanks, who interviewed me about how the book came to be. Kim is an excellent writer and blogger. 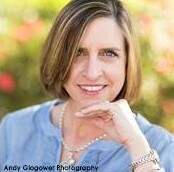 She is a wife and a mother of two adult children who have ﬂown the coop and left her with an almost empty nest. Her “baby” is a comical Welsh Corgi named Sir Higgins. Kim is relatable and has a genuine heart to come alongside others in the empty nest stage of life. I know you’ll enjoy her writing. Head on over to Kim’s blog and read her interview. Here is the link. Comment on her post to enter her giveaway of the book. Sign up for her blog! I appreciate you and we’ll talk again soon. I hope you had a joyous Easter. We had such powerful worship at our morning church service. It moves me to tears to know my God is alive. And because He lives, we can too. And not just live, but live abundantly. 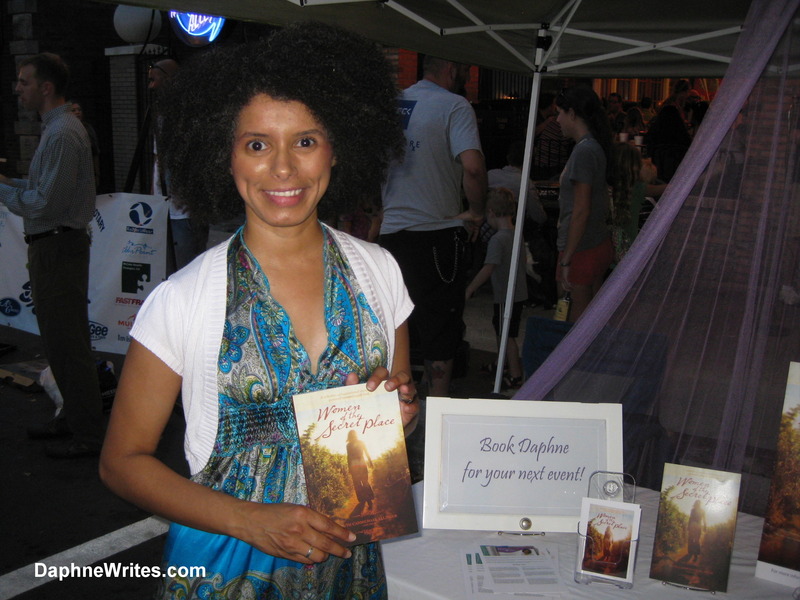 This past Saturday, I had the privilege of showcasing my books at “Meet the Author on the Park” in Winter Haven, Florida. This event was sponsored by my friends Sandy Knowles at Three Rivers Press and April Whitt at Grapefruit Press. I met many people and was able to learn about their lives, their interests, and their troubles. 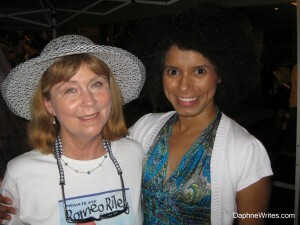 Sandy and April, the organizers of the event, offered authors the opportunity to speak to the audience via a loudspeaker system. (Yikes!) I was up for the challenge and spoke to festival-goers about some tips for writing about difficult topics. 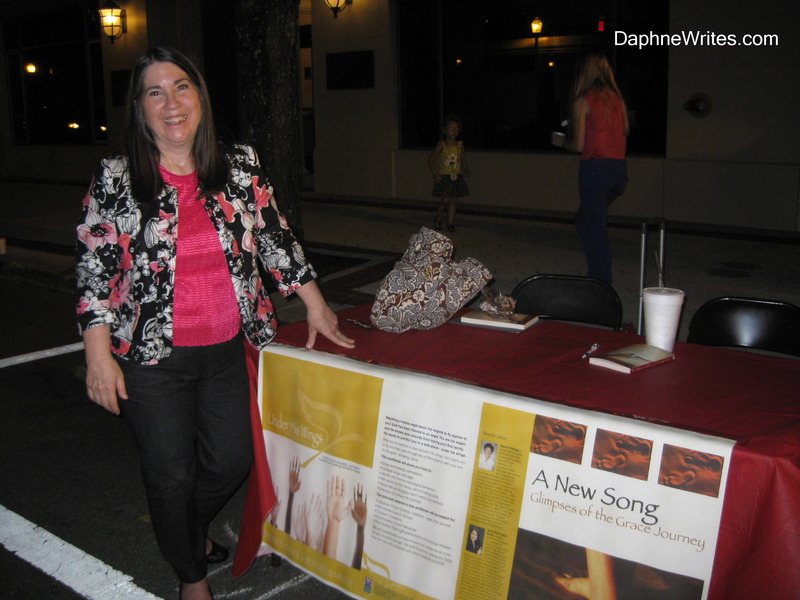 I also shared about my latest book, Dragonflies, Ketchup, and Late-Night Phone Calls: 31 Days of Journaling God’s Blessings. I haven’t officially shared with you about this book, which was such an inspiration to me as I wrote it. Dragonflies, Ketchup, and Late-Night Phone Calls is a unique thankfulness journal where you literally “jot down” your thanks to God throughout your day. Here is a snapshot of one of the chapters. As you can see, I open each of the 31 days with praise to God and then provide you some space to give thanks to God throughout your day. No journaling for 10, 15, 30 minutes or an hour-not that there’s anything wrong with that. 😉 The approach is to jot down your thanks as you go through your day or when you lie down for the night. During my 10-minute talk, I was honored to talk about the inspiration for my book, which came about during my husband’s job loss last year. 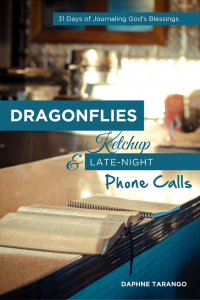 Writing Dragonflies, Ketchup, and Late-Night Phone Calls was my way of keeping a thankful spirit during our financial troubles, our roller coaster feelings of hope and frustration, and all of the emotional, physical, relational, and even spiritual side-effects of such a loss. 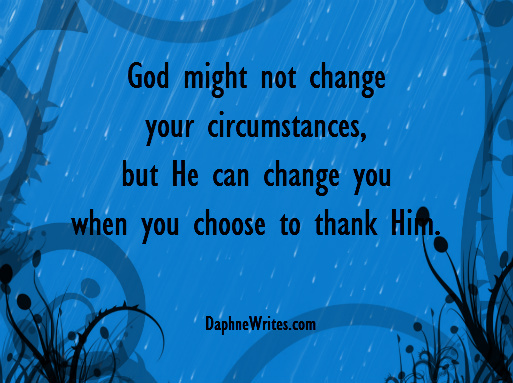 God truly can help us through difficult times when we are intentional about giving thanks in all circumstances. It’s not easy; it still isn’t, but we have renewed hope and know God has been our provider during this time. Remember, friends: God might not change your circumstances, but He can change you when you choose to thank Him. Big hugs. So… What are you thankful for today? 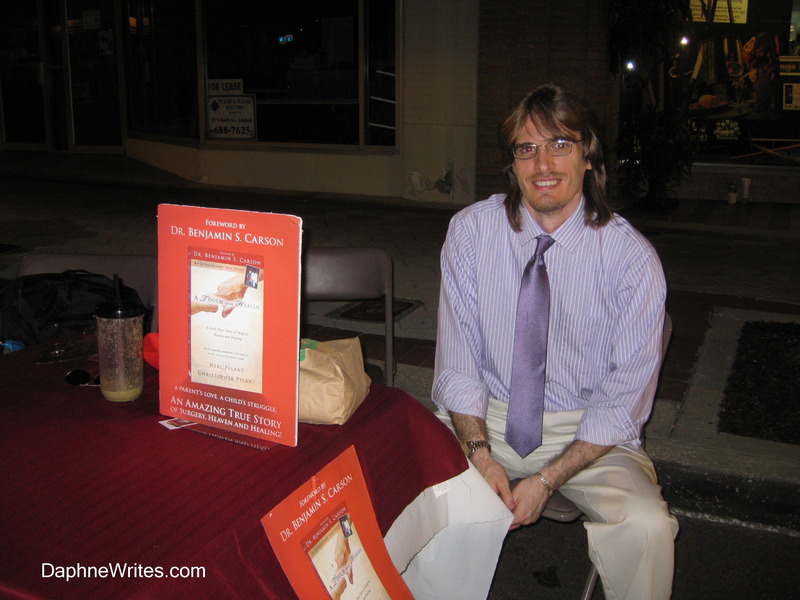 I had some opportunities to display and sell my books at the 4th Annual Polk Writers and Illustrators Festival here in Lakeland, Florida. I met a lot of great people and was able to share my story with them. 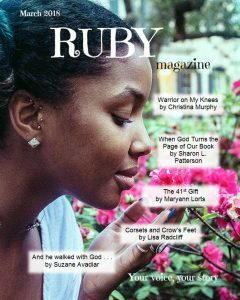 I was so proud to be one of six writers from our very own Lakeland Christian Writers, a chapter of American Christian Writers (ACW). Here are some of them. Truth Factory is “a platform for local Christian artists to share their unique and inspirational gifts with the greater Lakeland community. We strive to encourage creativity which portrays the principles of Christianity in the tangible form of artistic expression. Artists are invited to showcase their talents and demonstrate the breath of creation reflected in their body of work. We promote artistic freedom for artists to express their love of God, to share His message of hope and to communicate their personal experience of Him with others. I look forward to participating in other Truth Factory productions, along with other local artists. I’ve been trying to work on my writing full-time and treating it as the career I want it to be. I’ve also been in prayer about the best ways to supplement my family’s income with the talent God has given me. After much research, I’ve decided to become an affiliate publisher of several big-name and respected merchants: DaySpring, Family Christian Stores, and Amazon. Please know I am in no way employed by these companies. What it does mean is that you might see links and images throughout my web site that advertise products from these merchants. When you click on a link and make a purchase, I might receive a small commission in return. You can read more about my role as an affiliate publisher on my disclosure page. I hope you will browse around those pages and see what interests you. Share the resources with your friends and family. I will update the products periodically, so check back often. Please keep me in prayer as I continue doing what God has laid on my heart. I want to encourage others with the comfort He has given me. I want everything I do to point to Him. By the way, what’s going on with you? Share in the comments. I want to join with you in prayer. I hope you are doing well and enjoying the many blessings of our Lord Jesus Christ. He certainly has been good to me. Here is an update on all that’s been going on… and there’s lots! 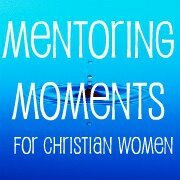 Mentoring Moments for Christian Women, June 2013. The Gabriel, Spring-Summer 2013 (page 16). Several weeks ago, the Celebrate Recovery Pastor at Bell Shoals Baptist Church (BSBC) in Brandon, Florida, invited me to speak at their Celebrate Recovery program. I was so honored by their invitation to share my testimony with them. They have a great group of participants–so welcoming and transparent. I felt very much at home! I hope and trust that my story–God’s story in my life–helped even one person in the room. A very special thank you to all who came out to support me. I will be podcasting soon! I’ll send you more information about it as the date gets closer. I plan to record some posts, as well as interview others and provide you with other tools to comfort–and empower–you on your journey. I can’t wait. This is exactly the kind of manuscripts that we are looking to get into our lineup and market. There are so many women that could benefit from this, and we are 100% on board. I am beyond ecstatic about this. In the days before I heard back from them, I prayed to God and told him I turned it all over to Him. If it wasn’t His plan, to close the door. If it was His plan, to make it obvious and to work it all out for me in such a way that I–and everyone–would know that only God could pull it off. He has! My heart rejoices with the Love of my Father. So… You’re probably wondering the type of book. For now, I’ll just say that it’s an inspirational book for hurting women. God willing, I plan to have the book ready by year-end. I know that’s soon, but if it’s God’s will, He will make a way. If not, then we’ll plan for next year. I want to thank you for your ongoing support and encouragement. I appreciate your emails, your “likes,” comments, forwards, tweets, stumbles, and all your interactions–not only with me but with each other. God keeps showing me, especially on those days I question myself, that I’m on the right path. So, thank you! Please let me know how I can pray for you. I want to join with you for those things that weigh heavily on your heart. It’s finally feeling like Fall here in Florida. I have the windows open, and the breeze is quite refreshing. Please visit Mentoring Moments for Christian Women to read my latest article, “Cell Phones, Hurts, and Broken Hearts,” which is part of the “Jesus Is…Healer/Deliverer” series. I am so blessed to be part of the staff at Mentoring Moments. We have a great group of women whose hearts are to minister to other women at all stages of their lives. We truly strive to provide that mentoring described in Titus 2. I have more news coming up in the next few weeks, but I’ll wait to share until then. In the meantime, I wish you much healing in our Lord Jesus Christ.